Creating Alerts from Server based on Decimals? I'm hoping to allow users to create alerts when certain metrics are above or below a threshold on the server. I'd like to allow account managers to get alerts when the variance in some metrics from current month to prior month is below, for example, 30% (.3). I could be using this completely wrong, but on the server it is only allowing whole numbers to be selected for this which doesn't give me what I'm looking for. Am I using this incorrectly or is this what it was designed for, and if so how would I create alerts based on percents or decimals? 1. Re: Creating Alerts from Server based on Decimals? Then pull that out and make it your alert criteria. Makes for an ugly viz, but a functional alert. 2. Re: Creating Alerts from Server based on Decimals? This makes sense, but I'm wondering how I can implement it without having a really ugly axis exposed. Is there any way I can utilize the alert without having that exposed? 3. Re: Creating Alerts from Server based on Decimals? Yes! Jonathan Drummey has the solution for you here: Re: Tableau subscription -> Is there a way to trigger the subscription whenever underlying data changes. Funky but effective. 4. Re: Creating Alerts from Server based on Decimals? 5. Re: Creating Alerts from Server based on Decimals? 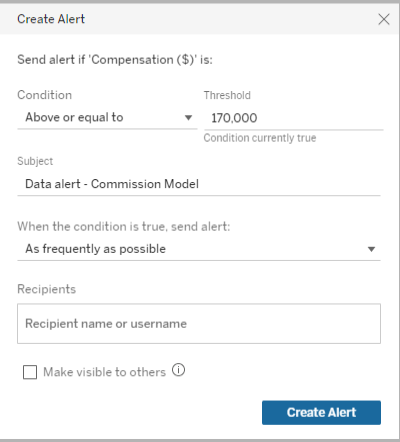 So, yeah, when you are setting the alert threshold, Tableau will draw you a reference line so that you can see where your marks lie in relation to your alert threshold. Makes a lot of sense if you're using the measure value as a sizing dimension, but if you aren't, well...it doesn't. But again, if you're using the trick from the link above, you won't need to worry about what this looks like, because it won't show in your viz anyway.